If you’re type of person who wants to saunter through the swing doors of a saloon, head to the bar, order a whiskey which is slid along the bar to you, before settling down for a game of poker, then you’re either a member of the Village People or you’re a fan of the Wild West! This game by Play N Go covers that era perfectly, featuring cowboys, wanted posters, a sheriff’s badge and even one of the beautiful ladies from the brothel upstairs. 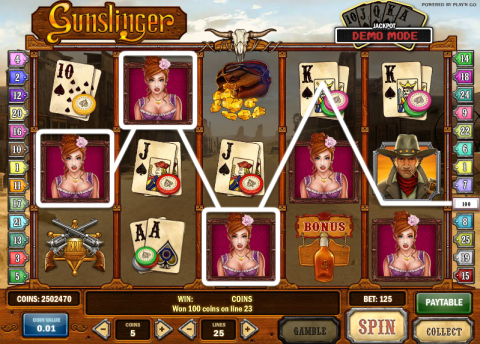 In this review I delve into every aspect of this slot based around the American west. I start by looking at the basic structure of the slot, before looking at the pay table. I move on to describe the features you’ll find when playing, including the four bonus rounds. I finish by giving an overview of the slot and recommending an online casino where you’ll play Gunslinger. This slot is a 5 reel slot with a maximum of 25 win lines, although you’ll be able to play as many or as few win lines as you want. You’ll also be able to choose your coin size, as well as a highly customisable auto play feature – with options to stop when winning a certain amount, on any win or if your balance exceeds a certain amount or decreases to a certain amount. The Nuggets of Gold symbol is the best standard one in the game, and will pay out if landing two or more consecutive times from left to right on a win line – landing all 5 will win you 1000 coins. The lady of the night is the next best symbol followed by the sheriff’s badge. After this you’ll find the playing cards from 10 to Ace. The Cowboy is the wild symbol in the game and will pay a whopping 10,000 coins if landing five on a win line. This slot has a number of impressive bonus features. Firstly there is a Stallion scatter symbol which will multiply the total bets staked on a spin – 2, 3, 4 or 5 symbols will double, treble, 20x and 100x the total stake respectively. Secondly the free spins bonus round is activated when landing three beer bottle symbols on any of the reels. Here you’ll shoot one of the bottles which will reveal the number of free spins you’ll have. The third feature is the one where you can win the progressive Jackpot. This is activated when achieving a win with each of the five different playing cards. You’ll be taken to a feature where there are 5 cards face down, and each card will either reveal an amount or a sheriff’s badge. You’ll win the amount on each card, however should you turn over 5 badges you’ll win the progressive Jackpot. The fourth and final feature is perhaps the best. This is the bounty hunt bonus and is activated when landing three wanted posters on an active pay line. Here you’ll be taken to an impressive game where you’ll start by choosing which enemy you want to confront. You’ll then walk along the deserted dirt street, firstly shooting three barrels which reveal a cash prize, before confronting the gunman. Survive and you’ll receive a multiplier on the wins. In my opinion the perfect slot will have a progressive Jackpot, free spins, wilds, scatter symbols and original and fun features. This slot ticks every one of those boxes! The game is highly playable and has a very professional feel to it – it being very clear that a lot of time and effort has been dedicated to making this game as good as it is. When playing, the game has an addictive quality as you’ll endeavor to move through each of the features, and having achieved them once, you’ll want to again. This slot is certainly one of my top ten – highly recommended.